Though root canal procedures tend to have negative undertones, they are one of the most beneficial dental procedures available. Though root canal procedures tend to have negative undertones, they are one of the most beneficial dental procedures available. Most people assume root canal procedures take extensive amounts of time and leave patients in pain for days. In reality, root canals can save your infected tooth from extraction. Millions of teeth are saved each year due to root canal procedures. When a tooth first decays, it begins eating away at the tooth’s outer enamel, eventually making its way to the inner pulp chamber. The pulp contains blood vessels, nerves and connective tissue. Your Longmeadow dentist can usually remove the tooth’s decay with a simple filling if the decay has not yet reached the pulp area. 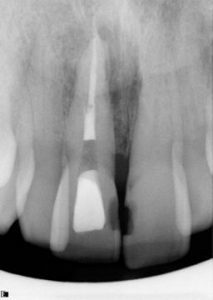 If the decay has reached the inner pulp chamber though, a root canal is the necessary treatment. Signs to look for include: pain, prolonged sensitivity to heat or cold, tenderness to touch and chewing, discoloration of the tooth, and swelling, drainage and tenderness in the lymph nodes as well as nearby bone and gum tissues. The infection can also spread outside the tooth, creating an abscess on the gum. In some cases, however, there can be no symptoms. First, the decayed area of the tooth is numbed. Next, your Longmeadow dentist makes an access hole in the top of your tooth to remove the decayed or dead inner tissue using special tools. Once the decay is removed, your dentist scrubs the inside of the tooth to make sure that the infection is completely eliminated. Finally, your dentist fills the clean tooth using composite material and then totally seals the tooth. Usually, a dental crown is placed over the newly clean tooth for protection and stability. If you have decaying teeth, make an appointment for a tooth canal procedure with your Longmeadow dental professional today.